As the First World War drew towards a close there were about 185,000 British POWs, including men from Buriton – and records studied by the Heritage Bank team now reveal some information about them. William Langrish, from Weston, was captured on 31st October 1914 near Ypres and by 19th December he was over 600 miles further east, in a camp at Altdamm in present-day Poland. Able to receive parcels, he wrote a letter of thanks, on 1st December 1915, for underclothes, cigarettes and bread. By January 1917 he was further west, at Dulmen (near Munster), but records suggest he had also been at Friedrichsfeld, near Duisburg. Soon after the armistice the Hants & Sussex News reported that he was amongst recently-returned POWs. William Fisher, from South Lane, was captured on 3rd September 1916 at Hamel and in October he was in a German war hospital at Caudry, near Cambrai. He was soon moved almost 500 miles eastwards to a hospital camp at Grafenwohr, Bavaria, recovering from a gun-shot wound. 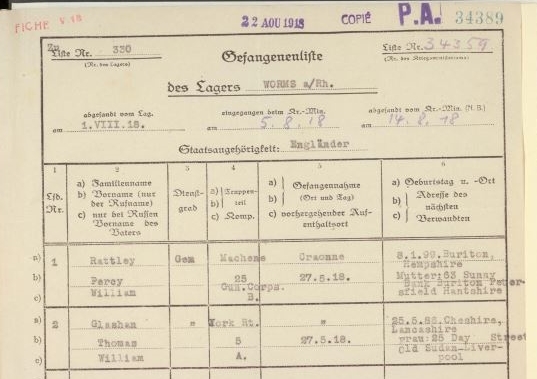 By 5th December he had been moved again, to Nuremberg, about 50 miles away and was still there on 3rd January 1917. It is probably a letter from him that was published in the H&S News in December 1917 and, before the war’s end, he had been moved again, to Erlangen and to Bayreuth (both north of Nuremberg). He was also back in Britain fairly swiftly, being discharged on 24th December 1918. Percy Rattley, from Sunny Bank (Kiln Lane), was captured on 27th May 1918 close to the River Aisne (about 20 miles NW of Rheims) as the Germans commenced the (3rd) Battle of the Aisne – part of their Spring Offensive. Records suggest that Percy was not wounded and, by August, he was in a prison camp at Worms, about 200 miles to the east. This was apparently one of the largest camps, possibly holding over 20,000 prisoners. He subsequently spent time in at least one more camp, at Hameln, being recorded there in October 1918: about 175 miles north of Worms. At least one other Buriton man was taken prisoner, but died in captivity in 1916. Ernest Dennis was serving in the 1/4th Hampshires and was amongst thousands of Allied troops forced to surrender to Turkish forces at the end of the siege of Kut-el-Amara in April 1916. He probably received insufficient food and would have faced epidemics of dysentery, cholera, and malaria, as well as a Turkish regime which did not, in general, follow Western rules when dealing with prisoners of war. He died on 31st August at a PoW work camp at Entelli, in the Amanus Mountains in Southern Turkey. Prisoners held here were constructing part of the Berlin to Baghdad railway line, including a tunnel through twelve miles of rock to connect Entilli with Bagtche. Elsewhere, in camps across Europe, POWs were sometimes kept in rather squalid conditions with inadequate food, clothing and sanitation. Cholera and typhus were common and the confinement also led to psychological illnesses. After the war many prisoners returned home with severe, permanent dietary problems following prolonged malnutrition.